U.S. President Donald Trump is expected to highlight a strong economy and call for bipartisan action on immigration as he gives his first State of the Union address Tuesday night. The televised speech before a joint session of Congress comes a year after Trump took office and about a week after a three-day government shutdown spawned by a fight over the federal government budget and how to deal with hundreds of thousands of immigrants who years ago came to the country illegally as children. Trump will focus on the campaign promises he says he has fulfilled and offer to work with both Democrats and Republicans to do more, according to the excerpts of the speech released by the White House Tuesday evening. "Just as I promised the American People from this podium 11 months ago, we enacted the biggest tax cuts and reform in American history," he is expected to say, boasting about providing "tremendous relief for the Middle Class and small businesses." On foreign policy, Trump is expected to note that the U.S.-led coalition "has liberated almost 100 percent of the territory once held by these killers in Iraq and Syria" but he will also acknowledge that “there is much more work to be done” to defeat the militant group. Immigration will also be a critical component. He is expected to promise that "struggling communities, especially immigrant communities, will also be helped by immigration policies that focus on the best interests of American workers and American families." The Capitol Rotunda is seen with the statue of George Washington on Capitol Hill in Washington, Jan. 30, 2018, ahead of the State of the Union address by President Donald Trump. Agriculture Secretary Sonny Perdue has been named the "designated survivor" during the State of the Union speech. Each year, one member of the the president’s Cabinet is whisked away to an undisclosed location during the address in case a catastrophic event occurs and wipes out the line of presidential succession. The tradition harkens back to the dawn of the Cold War, amid fears of a nuclear exchange with the Soviet Union. After the vice president, the speaker of the House, and the president pro tempore of the Senate, the line of succession goes to Cabinet secretaries in the order they were created, beginning with the secretary of state and ending with the secretary of Homeland Security. One member of Trump’s Cabinet cannot serve as a designated survivor: Secretary of Transportation Elaine Chao, who was born in Taiwan and does not meet the constitutional requirements to serve as president. The designated survivor is briefed on what would happen if tragedy strikes during the speech and prepares to take over duties as the acting commander-in-chief. 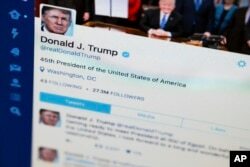 FILE- President Donald Trump's Twitter feed is photographed on a computer screen in Washington. April 3, 2017. Trump's year in office has been marked by his frequent Twitter attacks on his political opponents, Democratic lawmakers and the occasional Republican who have drawn his ire for opposing his policies. In politically fractious Washington, however, the White House has said Trump will give an optimistic speech, calling for resolution of contentious issues by both Republicans and Democrats working together. Trump is giving his address at time when his voter approval ratings are the lowest ever for a president at this point in his four-year White House term, with the latest Gallup poll showing Americans disapprove of his handling of the presidency by a 58 percent to 38 percent margin. In nine months, American voters head to the polls again for congressional elections, with all 435 seats in the House of Representatives and one-third of the 100 Senate seats being contested. As is tradition, several Democrats will give shorter response speeches after the president finishes his address. At least 14 Democratic lawmakers announced they plan to boycott the speech. 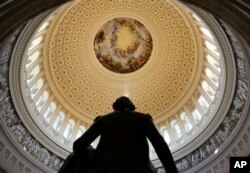 It could be the biggest known boycott of a president's State of the Union. Rep. John Lewis of Georgia said he would not attend. "At this junction, I do not plan to attend the State of the Union," Lewis said on MSNBC. "I cannot in all good conscience be in a room with what he has said about so many Americans. I just cannot do it," he added. Rep. Juan Vargas of California tweeted Monday afternoon on his decision not to attend: " @POTUS continues to disrespect women, insult people of color, and attack our immigrant communities. I will not be attending the State of the Union—I stand in solidarity with all the people he has and continues to disrespect. #SOTU"
Rep. Maxine Waters of California, a harsh Trump critic, also said she wouldn't be going. When asked on MSNBC if she had plans to go, she said: "Oh, no." "Why would I take my time to go and sit and listen to a liar?" Waters also sat out Trump's address to Congress last year. This is not the first boycott of a president's State of the Union address. In 1999, President Bill Clinton spoke in front of a divided Congress in his State of the Union address, just weeks after being impeached by the House of Representatives. Some Republicans decided not to attend. They included Reps. John Shadegg of Arizona, Bob Schaffer of Colorado, and Tom Tancredo of Colorado and Bobb Barr of Georgia. The previous largest known boycott of a president's address came in 1971 by all 12 African-American lawmakers in the House, who were also members of the newly founded Congressional Black Caucus. The members wrote to President Richard Nixon for a meeting, which they said he refused. In turn, they skipped Nixon's speech.